I know, I say it every month but it just seems like I was sharing my September faves. And now we are finishing up another a month and getting closer to Christmas and the end of 2018. So let’s get cozy with my favorite things from October! I’ve been working on some Christmas knitting projects and am finding myself falling in love again with cable and colorwork patterns. There’s just something so comforting about these and they definitely make me feel like it’s fall. I’m already planning on asking for a sweater quantity of yarn for a colorwork sweater for Christmas! Even though it’s been chilly, I’m back on the smoothie bowl train! I still love my protein cakes and they are my favorite dessert but I’ve been defaulting to smoothie bowls after my cross training workouts. And our new NutriBullet blender makes them super fast to mix up! My favorite toppings for these have still been peanut butter, chocolate chips and coconut flakes. By now, a lot of the trees have dropped their leaves but we had some gorgeous fall colors this fall. I was so glad that I was able to get out to Afton State Park for a run before most of the leaves dropped because it was magical. So many shades and yellow, red and orange and it occasionally looked like it was raining leaves as I ran..
Don’t forget to share your favorite things from this month in the comments! August is over and we’re heading into fall! I’m so excited for cooler weather (for both running and handknit garment wearing) but August wasn’t that bad for running. Sure, my last run of the month wasn’t the best but that was just one out of twenty two. So I enjoyed about 95% of my runs which is pretty good. 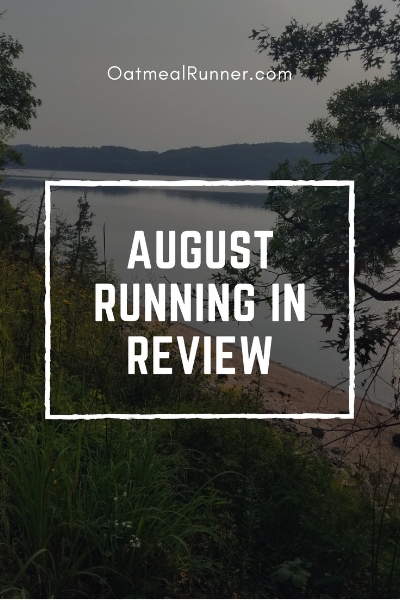 One of my favorite things about August running was that I got in three trail runs at three different locations: Theodore Wirth Park, Afton State Park and Fort Snelling State Park. All three were very different runs but I loved them all. And I can’t wait to hit the trails as we get into fall and the leaves start changing because it will be gorgeous! I also enjoyed purposely cutting back my mileage slightly to accommodate adding in speedwork. I ran 23 less miles than in July but my average pace was 15 seconds faster in August. I still can’t believe that my average pace was below 10:30 for the month. I can tell I’m running stronger by adding in speedwork, cutting back mileage, adding in core work and focusing on cross-training and stretching. It’s a balancing act to get it all in and it doesn’t always happen but it helps so much. How was your August for running? Let me know in the comments!